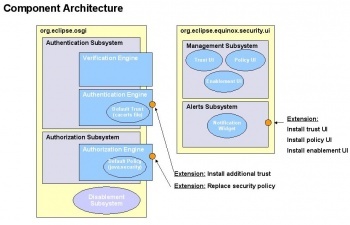 The following is a stakeholder needs and high level design document for 'Trusted Bundles' - security related functionality being developed for the Eclipse 3.4 release. We will be building upon the 3.3 work of applying signatures to the bundles that make up the Eclipse platform. The exercise of defining a direction for security functionality must begin with the identification of these stakeholder and an evaluation of their needs. This addresses the most fundamental needs of the most important stakeholders. The beneficiaries of the solution will be Eclipse users, administrators and community members – such as member companies and the foundation itself. 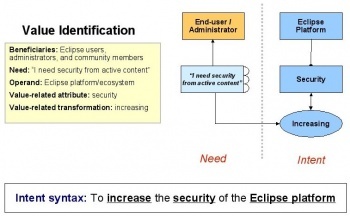 The operand – which is the object of the value related change – is the Eclipse platform itself, and the value related attribute is security. In this case the transformation will be increasing. See the system intent diagram which details stakeholders, needs and defines the system intent. See the system goal diagram which specializes the intent into a specific system goal. The concept uses the cryptographic formats used by Jar file format for verifying the integrity of signed bundles. Authenticating the signers will be enabled through standard chains of X.509 certificates. This standard signature and certificate format will be joined with the lifecycle of the OSGi runtime, allowing the ability to enable or disable bundles based on the content integrity and signer authenticity. 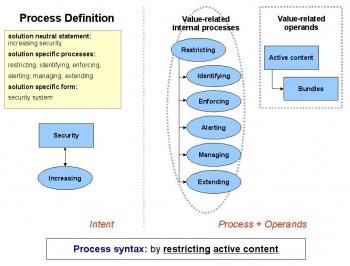 See the system concept diagram which describes the specific process and decomposed it into constituent processes. The authentication subsystem is responsible for identifying content; specifically it performs the function of verifying signed content, and authenticating trusted signers. 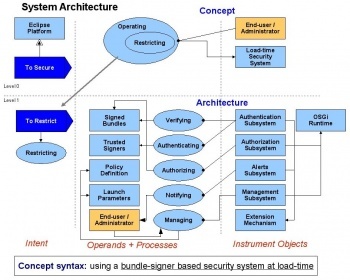 The subsystem is responsible for processing bundles as they are loaded from the filesystem into the OSGI runtime. There are two engines implemented by the authentication subsystem, the verification engine and the authentication engine. The verification engine exposes an API for inspecting the details of a piece of signed content. The verification engine uses the authentication engine to establish the authenticity of a signer by verifying the certificate chain presented alongside the signed content. The authorization subsystem is responsible for enforcing a policy based on a piece of signed content. Specifically, it does this by authorizing the bundle to load based on its authentication status and a defined policy. If the bundle is not authorized, then it is placed into the disabled state as supported by Equinox. In this state, the bundle will not be activated, nor will it contribute services or Eclipse extensions into the system. If it is authorized, then the bundle is allowed to load as normal. The alerts subsystem is responsible for alerting the user when unknown or potentially malicious content is encountered. It monitors when bundles are disabled by the authorization subsystem and supports notifying the user via a notification widget on the status line. When there are no problems in the system, a green shield will be displayed, meaning that the system is running in compliance with the defined authorization policy. If a bundle is disabled due to an authorization failure, the widget will throb a yellow or red shield, depending on the severity of the situation. The user clicks on this widget to invoke the management subsystem, where they can deal with the situation in a manner consistent with the concept of “safe staging”. The management subsystem is responsible for managing the configuration of the system. The particular functions that it supports include setting the launch parameters required to enable the system, adding and removing trusted signers to the installed trust engines, and editing the parameters of the current authorization policy. The extension mechanisms support deployers and developers in extending the system with additional and alternate implementations of certain services. Specifically, the system allows for the installation of additional trust engines for authorizing content, for the installation and specification of alternate policy engines, and for the contribution of alternate user interfaces for managing enablement, trust and policy. This page was last modified 18:54, 9 January 2008 by Matt Flaherty. Based on work by Eric W Li and Thomas Watson.